Design thinking provides opportunities for structuring e-collaboration efforts and for gaining a deeper understanding of the process and the product. This chapter outlines strategies for improving the perceptions and skills associated with collaborative effort using cognitive remapping, 3D visual cues, models, and methods supporting design thinking. The study features insights from years of applied immersive 3D design thinking studios involving students and researchers across academia and military institutions. 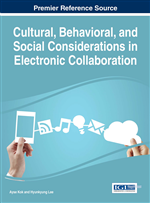 It concludes with recommendations for improving the perceived value of electronic collaboration involving trans-organizational teams. Design thinking describes the emotive and cognitive techniques for reframing the perceptions and beliefs of collaboration. Applying design thinking for e-collaboration between researchers or students with no professional or personal ties strengthens the opportunity to achieve synergy during the pursuit of the desired outcomes. This chapter explores design thinking characteristics, and how they impact the mental models of collaboration. It examines the relationship between teamwork and educational theories, such heutagogy and constructionism, and it offers examples from the design studio experiences of graduate students and game-based examples from researchers during a 10-week summer experiment. E-collaboration in immersive 3D spaces presents technological, group and process challenges that seem simple when compared to the barriers presented by each participant’s beliefs and fears about teamwork. Immersion in this research does not center on the use of a head-mounted display device, but on the intersection of people working, learning and socializing inside a 3D world. Design thinking leverages immersion to encourage creativity as teams develop a strategy for group work and shared outcomes. Online collaboration strategies blend 1) voice communication, text and video; 2) a process for managing cooperative work; 3) techniques for leveraging conflict; 4) integration and version control for group products. In online classes that feature activity-based learning, groups explore ideas and create working prototypes using social constructionism. Constructionism asserts that learning is an active process involving the creation of knowledge and understanding from experiences in the world, leading to personally meaningful products (Resnick, 1996). Social constructionism extends activity-based learning by encouraging discussion and cooperatively constructed views of the world. Electronic collaboration, called e-collaboration, uses technology through a mix of asynchronous and synchronous communications to share ideas and design characteristics during group activities. E-collaboration in a 3D immersive environment transforms an empty landscape into visual scenes populated with 3D content that simulate a place or a meeting space. These virtual spaces transform into a virtual world when people socialize and interact within the setting, offering opportunities for collaborators as students, designers or researchers to meet and conduct cooperative work. In a virtual world, the group members can see themselves in relationship to the content as it is displayed around their avatars, and an avatar represents their sense of self. Within these 3D settings, the design studio is both a physical studio for creating group projects, scenes and simulations, and it is a conceptual framework for understanding the process of idea generation, exploration and creativity. Virtual world design thinking personalizes e-collaboration, provides a technological infrastructure, and embraces the creative process through individual constructivism and social constructivism as team members work cooperatively to generate ideas and depict them in 3D designs. Heutagogy describes a learning approach that encourages students and teams to practice self-determined learning as they set expectations and take responsibility for their collaborative activities. The focus extends beyond the accumulation of facts and how adults learn through experience (andragogy) to ownership of the process and the group’s products. Design thinking encourages learner-centric collaborations and presents characteristics that strengthen the team experience and lifelong learning. Potential barriers to using social constructivism in collaborative teams stems from the beliefs and perceptions about group work. Support exists for the use of 3D worlds as an immersive experience in which teams can experiment and discover how to accomplish the learning objectives while reflecting on their culture and behavior (Kapp & O’Driscoll, p. 88). Realizing value from constructionist learning environments, however, is not likely to emerge independently in 3D worlds. Educators and learners take the time to customize their avatars and to learn to communicate, gesture, and emote as they share their ideas and collaborate on 3D projects (Calongne, 2008).